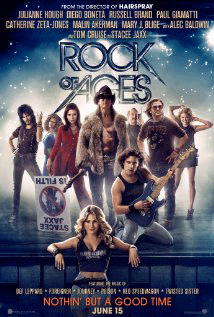 " Rock of Ages is a mixed bag of a totally awesome 80s soundtrack shaken with more than a sprinkling of decadence. What you really need to be concerned about - and it's the primary reason I can't give this film my blessing - is the film's high level of raunchiness. " Los Angeles. 1987. City boy Drew (Diego Boneta) and small town girl Sherrie (Julianne Hough) are chasing their Hollywood dreams, but when they meet, it's love at first sight and their perspectives drastically change. Musical cheesiness and decadence ensue. As far as movie genres go, one where people randomly burst into song is not at the top of my favorites list. However, I will admit that I’ve enjoyed a musical from time to time. Granted, they are typically of the variety of Dr. Horrible’s Sing-Along Blog and The Muppet Movie – the kind that don’t take themselves too seriously and actually know how to poke phone of the inherent cheesiness of the genre. The film is a big ball of cheese ready to be sliced and served on crackers. The love story induces eye-rolling so fierce that you will be in danger of detaching a retina. The acting is… questionable, to put it nicely. The singing is… questionable, to put it nicely. Yes! Somehow all of these flaws inexplicably meld into a nostalgic amalgam of what feels like a legitimate 80s movie. And as a child of the 80s, I appreciated that. Much like I appreciate hearing songs such as Paradise City, Every Rose Has Its Thorn, Jukebox Hero, and Nothing But a Good Time on the big screen. Now, the problem is that as exciting as it is to hear Bon Jovi’s Wanted Dead or Alive in a film, it’s an understatement to say that Tom Cruise doesn’t come close to doing the song justice. Some won’t care, but others will wish they had a fast forward button handy. Remember what I said above about the singing? Julianne Hough and Cruise apparently took the same “How to Sing Through Your Nose” course. “Poor Man’s Brittany Spears” is not the impression a singer wants to leave. The story is as basic as it gets. A small town girl, living in a lonely world, heads to L.A. to find fame. Instead, she finds love in a barboy-wannabe-rock star. Cue the Journey songs. I have to give Tom Cruise credit – he does a good job of inhabiting the character of the “constantly late, reclusive, and non-sensical” Stacee Jaxx – an eccentric rock star with a leather-wearing, gun-wielding monkey named “Hey Man.” And Catherine Zeta-Jones is great as the film’s antagonist. I wish we had seen more of her. Hough, on the other hand, might want to cherish her dancing awards. She won’t win any acting ones any time soon. How much enjoyment you derive from the film’s entertainment value will directly correlate with your tolerance level of mash ups such as We Built This City and We’re Not Gonna Take It. There are several moments where the film truly is a toe-tapping good time. As my wife Kim pointed out, it often feels like you’re at a concert. What you really need to be concerned about – and it’s the primary reason I can’t give this film my blessing – is the film’s high level of raunchiness. I had to double check that it was rated PG-13. It pushes the boundaries of that rating, and for that rating to indicate that this is suitable for anybody near the age of 13 is laughable. Without going into too much detail, let’s just say the film features gratuitous amounts of scantily clad pole dancers, men groping women, and sexual innuendo. I had to constantly make a covenant with my eyes. The duet of I Want to Know What Love Is between Cruise and Malin Akerman particularly pushes the edge. Oh, and if you have any suggestions on how to erase the image of Bryan Cranston in tighty whities from my mind then I would appreciate it. Pouring hydrogen peroxide directly in my eyes didn’t work. American Idol’s Constantine Maroulis (the guy who always creepily stared into the camera as he sang) has a cameo as a record executive in the film. He originated the role of Drew in the Broadway production and was nominated for the 2009 Tony Award for Best Leading Actor in a Musical. Keep an eye out for Debbie Gibson’s cameo during the We Built This City/We’re Not Gonna Take It mash up. Catherine Zeta-Jones is in Ocean’s 12 with Scott Caan who is in Into the Blue with Josh Brolin who is in Hollow Man with Kevin Bacon. Rated PG-13 for sexual content, suggestive dancing, some heavy drinking, and language, Rock of Ages pushes the boundary of its rating. Profanity consists of 1 "f" bomb, several "s" bombs, several misuses of the Lord's name, and other mild obscenities. Sexual references and innuendo abound, so viewers need to beware. Dude. I think you missed a few cameos. I saw Leonardo Dicaprio and *at least* one of the Ramones. I think. DiCaprio? Where in the world do you think you spotted him? Kevin Cronin – lead singer of REO Speedwagon – also had a cameo, but I missed it. It’s funny that although Cruise and Baldwin consistently pull out good performances, I find their real-life personas so grating that it make me reluctant to see anything they’re in. I could be persuaded to see this with an ’80s obsessed friend, as the songs are phenomenal. Actually, the Bryan Cranston scene you mentioned actually may just be what sells me a ticket. That guy is priceless. Cranston is indeed hilarious. And the scene is actually pretty funny; it’s just the visual isn’t very pretty.